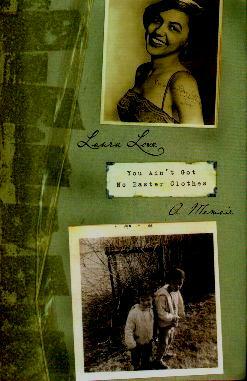 Singer/songwriter Laura Love writes about her troubled childhood and growing up in Nebraska in the 60s as an African American girl. She and her older sister saw their mother being taken away to the Nebraska State Hospital, went to live in a children's home, got their mother back, and then watched her try to hang herself in the basement of the house in which they were then living. Shortly thereafter, their mother graduated and got her degree, and a teaching certificate, and the girls got their mother back and they started living a "normal" life. Their mother got a teaching position and they had a home of their own, finally. But things changed and the girls weren't allowed to discuss their homelife with anyone. Even getting information about their "deceased" father proved difficult. From Lincoln they moved to Omaha and back but not before Laura got into a fight with another girl. The racial tension was high everywhere, even in Omaha, and Laura, being light-skinned, was picked on by all, including her school teacher. Her mother was constantly uttering racial slurs as well which confused the girls no end. Mom became unemployed again. Things plodded along until they moved once again and it was on the school stage, when Laura, with a guitar in hand, sang her lungs out and received a standing ovation. She knew then and there that she wanted to sing. She and her sister decided to leave home after one particularly horrible screaming match with their mother. They were only sixteen and seventeen respectively. Two young girls out on their own, working and fending for themselves, finding out about boys, and a few surprises along the way.